Stay tuned to additional overlooks at Little Grouse and Ajax! CC&V operations will be conducting two shots in Cresson Project today. The first shot will be in the South Cresson at 11am. The second shot will be at 1 PM in the Main Cresson. Times of the shot are subject to change. Thanks to Volunteer Weed Mitigators!!! Late-season wildflowers—particularly gentians—were the star attractions of a half-day Wildflower, Weeds & Water hike at Bison Reservoir on August 27. This second annual event was hosted by Teller-Park Conservation District (TPCD) and Newmont Mining Corporation (Newmont) as part of a State and Private Forestry (SPF) Grant to manage and eradicate noxious weeds. Fifteen people (including the landowner of a large adjacent property) accepted the challenge to hike through pristine bogs, Aspen forests, and dense willow stands to eventually end up at the high-altitude beaver ponds that naturally filter the water that drains from Pikes Peak to Bison Reservoir. The reservoir owned by the City of Victor and provides drinking water for residents, as well as water for use in mining operations. Only Victor building owners who pay a monthly water fee may apply for membership to access the property and fish at the reservoir. During the hike, participants discovered that an orange hawkweed infestation identified onsite in 2014 was eradicated. Orange hawkweed (Hieracium aurantiacum) is a perennial flowering plant that was introduced to the U.S. from Europe. It spreads fast quickly via stolons (runners), rhizomes, and seed, and can be challenging to banish. Early detection and rapid response is critical as the pretty little flowers displace beneficial, native plant species that work within the ecosystem to filter the water of a pristine wilderness area. TPCD and Newmont worked together in 2014 and 2015 to ID and manage this species. Monitoring and management will continue in the coming years to ensure it remains controlled and stamped out. It may take a few years of monitoring to ensure that any remaining seed bank in the soil does not make a comeback in the coming years. A plant list of more than 30 flowering or fruiting species was created to document sightings during the hike. You can view or download the list at www.TellerParkCD.org. The list includes six gentians found on the hike, including the somewhat elusive Marsh Felwort (Lomatogonium rotatum). The Marsh Felwort is reportedly seen in fewer than 15 counties of Colorado. In addition to this annual event, the City of Victor and TPCD hosted a Before & After yard beautification effort. Residents were encouraged to pull, mow, or crowd out noxious weeds in an effort to learn more about weeds, learn how to manage them, and work to beautify their properties in the process. 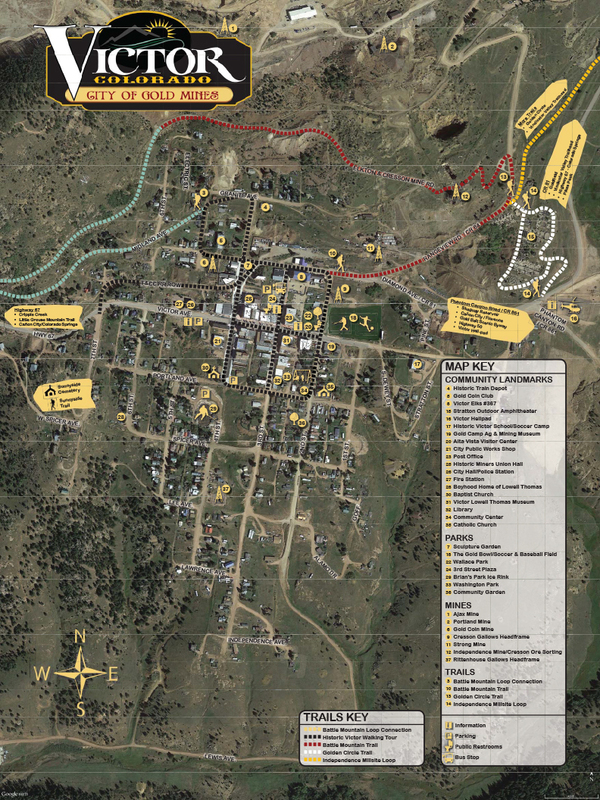 The population of Victor, a quaint mining town located at 9700’, is 400. The event ran through mid-September. TPCD and its cooperative weed management partners in the Upper Arkansas River Watershed work together annually to obtain grants like the SPF grant to manage noxious weeds in the nine-county area. Check out their website at www.UpperArkCWMA.weebly.com. Find out more about noxious weeds in Colorado at www.colorado.gov/pacific/agconservation/orange-hawkweed. Looking for Ore Cart Decorators! Let’s get the ore carts decked out before the Burro Races! Everyone is invited to come and create a scarecrow, bring your kids and anyone else that might be interested, many hands make light work. All components will be supplied, I have enough clothes, body forms, faces and hats to make 18. No straw involved, rafia will be used to stuff around the shirt and pants openings. If you have a special outfit or theme tshirt you’d like to use, bring them! Especially kids “Victor” tshirts. Size 10-12 work best. We will meet in the west suite of the antlers bldg at 5:30 this coming Thursday Sept 29. Dress warm! Hot drinks and snacks will b provided. This is an open invitation to the community! Come help dress up our downtown! Victor Municipal Code is Online! The municipal code is online. Here is the link to the City’s new code in pdf format. A more interactive code will be available in October. Gold Camp Road Repairs Coming! Teller County has finally received approval from the Federal Government and the State Historic Preservation Office to complete repairs to flood damaged Gold Camp Road. Bids have been let and it is hoped construction will commence in the next several weeks. More to come! There will be no clean up days scheduled in 2017. Please remove trash from your property in a timely manner.